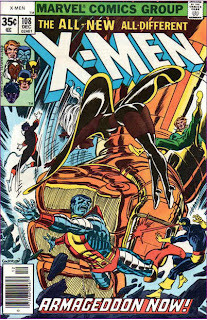 This issue ends with Havok, having been wracked with doubts about his true identity following his confrontation with Cyclops last issue, regaining his full memories and true identity, and swearing to make Genosha pay for what they've done. 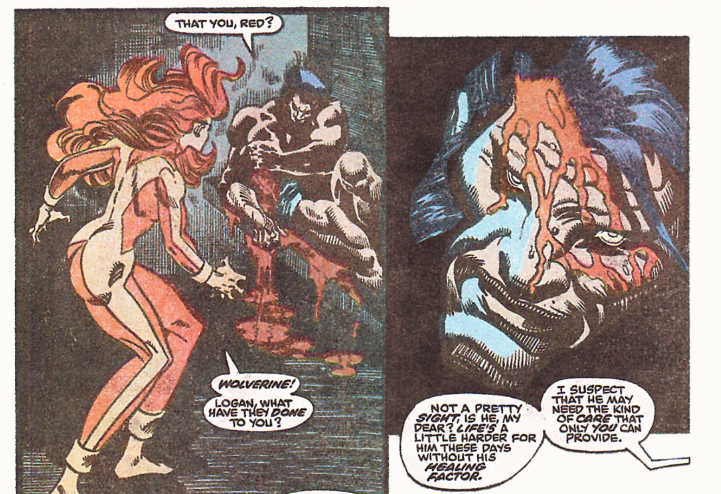 Placed in a cell together by Hodge, Jean and a greatly-injured Wolverine share a kiss. 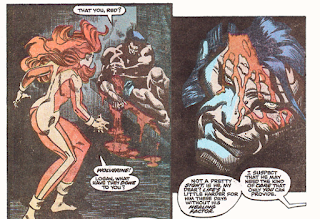 Though its suggested that Jean is responding to Wolverine out of pity for someone she believes to be dying, this is one of the first acknowledgements of Claremont's "Jean secretly pines for Wolverine" retcon by a writer other than Claremont, as Hodge explains that he read in Xavier's files about Wolverine and Jean's secret feelings for each other. 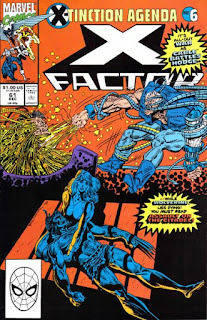 Between New Mutants #96 and this issue, after being captured, Forge has fallen unconscious. Later in the issue, we learn this is to make his mind unreadable by the Genoshan telepaths, so as to protect a secret weapon known only to him and Cyclops. This issue emphasizes the fact that in Genosha, there's a second class of "free mutants", like Wipeout and the Press Gang, who serve Genosha but aren't genetically-modified slaves like the Mutates. 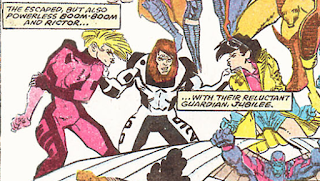 It's also established that Hodge's robotic body is designed to withstand the powers of the various X-teams, and that Right technology has been used to guard some Genoshan weaponry from Cyclops' blast. Cyclops once again get his costume (this time a Mutate disguise) destroyed in this issue. 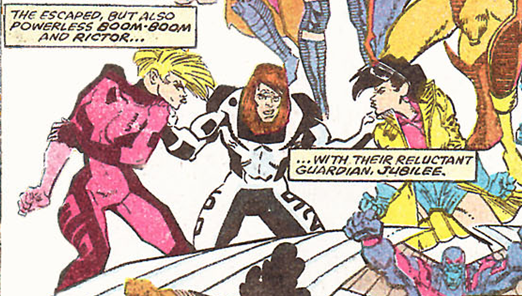 Artistic AchievementsI have no idea why Boom-Boom and Jubilee are making kissy faces at each other even while rolling up their sleeves as if to fight in their portion of the opening recap splash page. Last issue, Bogdanove's exaggerated gloppy tears drew my ire; this issue, it's the way he draws everyone with incredibly huge, pronounced lips. 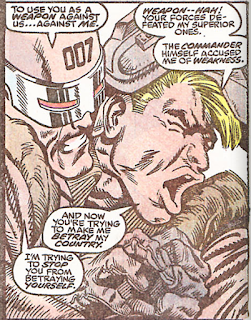 With his powers wiped by Wipeout, Cable's bionic arm is useless, which doesn't make much sense given that thus far, we've never been led to believe his arm is anything other than bionic, though it does somewhat retroactively fit with what we later learn about the relationship between Cable's arm and his power. As in the first Genosha story, this issue features a powerless Wolverine heavily injured without his healing factor to help things along. The second act of "X-Tinction Agenda" closes as most second acts of three act adventure stories do, with things looking their darkest for the heroes: Warlock is dead, Storm & Rahne are Mutate slaves, and almost everyone else is captured save for the de-powered Boom-Boom & Rictor, and Jubilee. 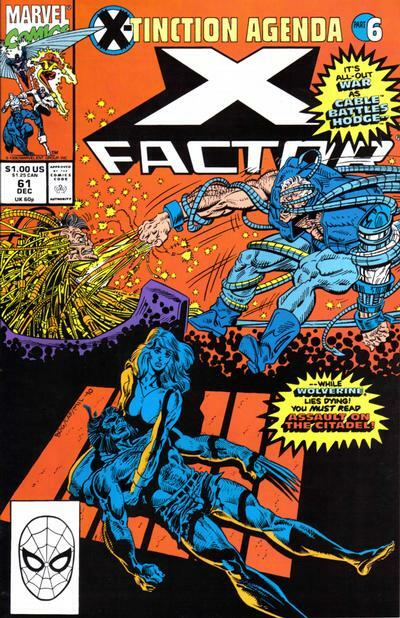 Simonson does an effective job of selling the despair of the situation, as every effort the combined X-teams make against Hodge comes undone (in part because thus far, no one knows Hodge is involved until they're at his mercy), but also planting the seeds (along with the tease Claremont inserted into chapter 4) for a potential turnaround, both in Forge & Cyclops' secret weapon, and in the issue-ending awakening of Havok's memories . 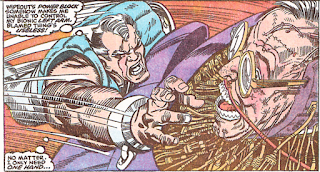 Bogdanove's art continues to be a hindrance to the story, with every character rendered in profile looking like a tiny blackhole six inches from their face is elongating their hair, nose and lips as much as possible, but the steady rhythms of the plot and structure of the story help push through it. Act One was the introduction of the threat and its opening salvo, Act Two the counterattack and ultimate defeat. That Act Three will involve a reversal of fortunes and the ultimate triumph of the heroes isn't meant to be a surprise; its impact comes from knowing it will happen, and seeing just how it comes about after this chapter leaves things looking so bleak. Teeb, I am disappoint. No mention of Scott Summers going in as "007", even after the plot itself has fun with Beast being brought in under the number of 666. What doesn't make sense is that according to the retcon, Cable's telekinesis is needed to control his techno-organic infection. So Wipeout's power block should have KILLED him. 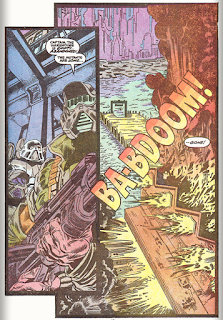 The scene where Banshee is defeated was very badly drawn- the idea was presumably that Hodge blasted him but you'd never know it from the art. Or. 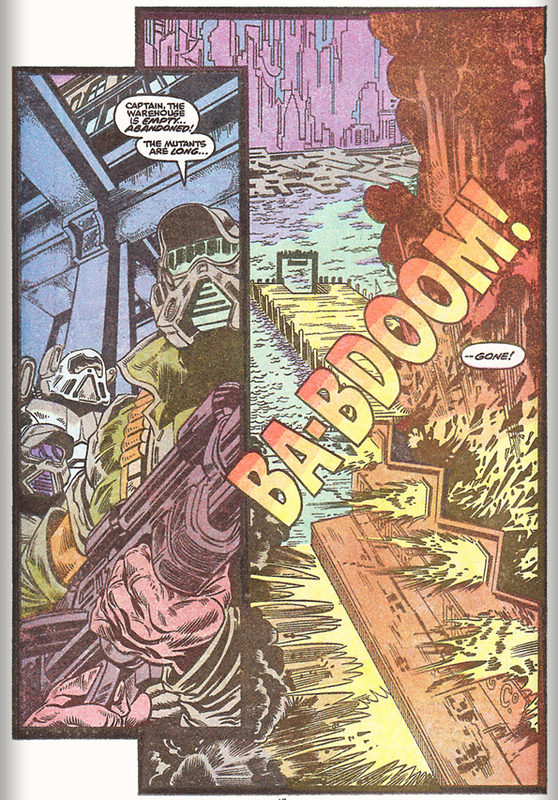 at the very least, Wipeout's power block should have led to images of Cable being slowly overrun by the T-O virus, which is something we'll see repeatedly down the road. "Placed in a cell together by Hodge, Jean and a greatly-injured Wolverine share a kiss"
Given how bloody Wolverine is (or supposed to be), that whole make-out session is rather icky. "we learn this is to make his mind unreadable by the Genoshan telepaths, so as to protect a secret weapon known only to him and Cyclops." 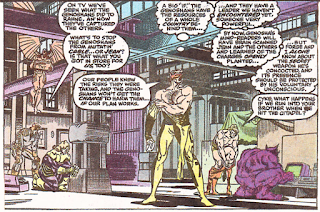 Of course, once Cyclops gets captured, the telepaths should be able to figure out the secret by reading Cyclops' mind, but they never do. "Cyclops once again get his costume (this time a Mutate disguise) destroyed in this issue." Shall we take bets on whether or not it also happens again next issue? The whole thing with Cable and his arm is a bit off. 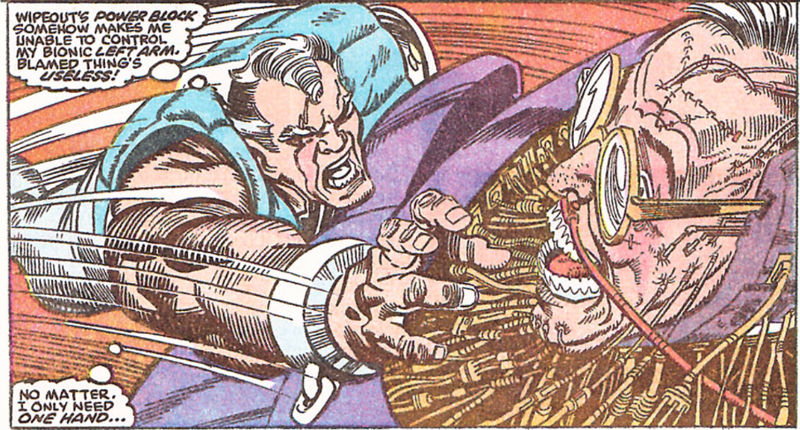 I don't think they ever explain why Cable losing his power would mean his arm gets switched off. Why not his eye as well? And Anonymous is correct, what happens here doesn't match at all with future retcons about Cable's power and TO virus. The Bogdonave/Milgrom art does drag down the story (even though you have Terry Shoemaker listed as the artist), but it still moves on along at a nice pace. If only Walt Simonson or an artist of his caliber, or a better inker than Milgrom, or both, had done these 3 issues, this crossover would have a much better reputation. That's another reason I read their kiss as more being inspired by pity than desire. 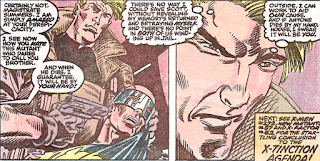 I also question whether being unconscious is enough to stop a telepath from reading the mind - the conscious mind, maybe, but it's not like Forge is dead. 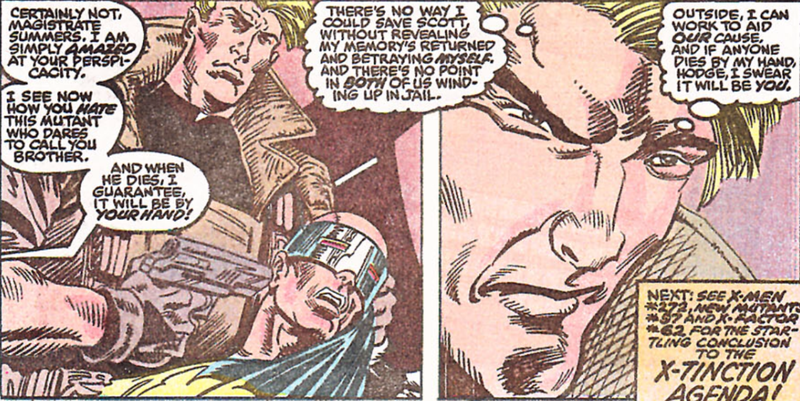 And Anonymous is correct, what happens here doesn't match at all with future retcons about Cable's power and TO virus. 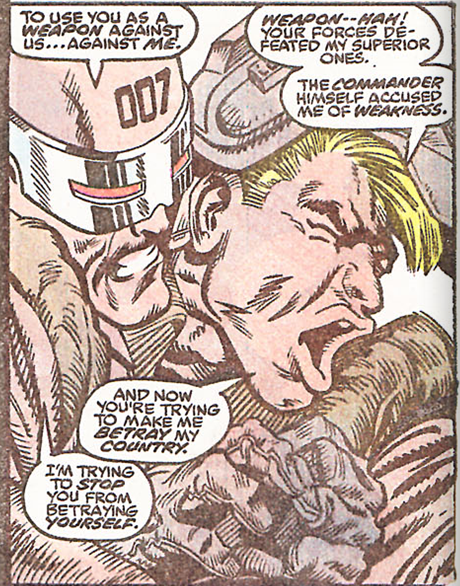 Yeah, I only meant that it's somewhat prescient in that it a suggests a link between Cable's powers and his bionics. The specifics are way off, but the general idea is the same. Whoops! Fixed it (I haven't updated my review template yet, since Bogdanove doesn't stick around for long. Waiting for Portacio's arrival. :) ). Didn't Professor X teach all the X-Men some level of resistance to telepathy? Cyclops is probably using that skill, which Forge doesn't have, to withhold information about the device. It's like two terrible covers mashed together! ISn't the Cable/Hodge bit more or less lifted from the issue itself? Also, did you see this, Teebore? That kind of thing has always really bothered me. I won’t get into details of how ridiculous it is since I’m commenting so late, but just… Feh. Even to him! “Wipeout’s power block somehow makes me unable to control my bionic left arm,” he thinks. An innate bionic/techno-organic/cybernetic ability thus apparently ruled out by his own surprise, we’re left with zero idea of what power(s) Cable actually might actually have. "with every character rendered in profile looking like a tiny blackhole six inches from their face is elongating their hair, nose and lips as much as possible"